Announcement Nature Focused Jewelry, made by my very own hands in the wild and forested state of New Hampshire. Thanks for finding me and enjoy your stay! 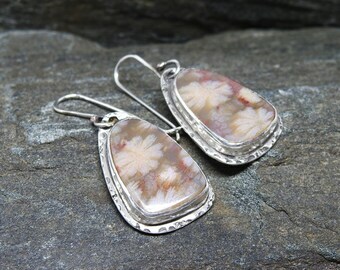 Nature Focused Jewelry, made by my very own hands in the wild and forested state of New Hampshire. Thanks for finding me and enjoy your stay! This is the second custom ring I have ordered from Wendy and I love it. The three dogs prints represent my three dogs. The time and care that was put into this was apparent and I am so grateful. Thank you much. What a gorgeous creation and very comfortable to wear! Thank you so much for sending so quickly! High quality craftmanship, quick delivery, beautifully packaged. The seller, WW is a true artisan because the detail and quality of her product is outstanding. Will not hesitate to shop here again. Assembling the bracelet before the final soldering operations. Little pieces and parts. 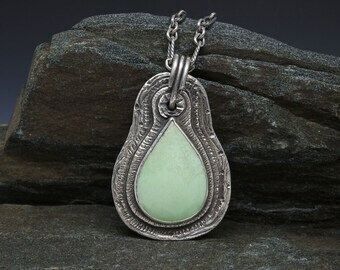 Looking up close at the setting for the indian paint stone in this necklace. Testing the fit is the 18k gold settings. A selection of some of my most recent (and favorite) pieces. All hand fabricated. Grandpa's Tools. For me they hold his spirit. Some work in progress. Stone setting on the left. Piercing a herd of wild horses on the right. Dylan Arthur Hawk. The best thing I have ever made. There is voice inside of me that I get to listen to when the scurry of day slows down and the sun begins to hide behind the trees. I can’t explain the voice, but it seems to be a drive within me that has made itself clear… it will not be ignored. It pushes me to listen and make the ideas swirling in my head. Sometimes that voice sounds like my grandfather who taught me how to solder silver. I hear his booming voice in my head giving me advice - motivating me, guiding me, encouraging me. When I hear that voice, I do what I am inspired to do. When I sit down to saw, or solder, or draw, paint or shoot a photograph, I hope that when I call it finished... that it will speak to someone else, as loudly and as deeply as the voice inside me sounds while I am making it. One head and two hands go into the making of the items in my shop. Each piece is handmade entirely by me. I am a full juried member of the League of New Hampshire Craftsmen. My work can be found in private collections and galleries in New Hampshire. Thank you for browsing my items, everything here is totally handmade by my two hands. Many of my items are one of a kind. Hand crafted items are different from mass produced items in that they are made individually with care and with inspired creativity. The handmade creative process sometimes brings with it unexpected surprises that result in unique results that can not be repeated. 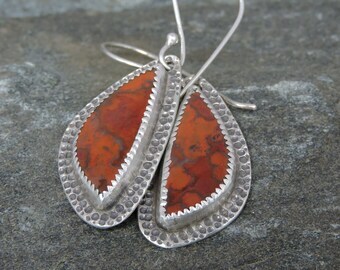 I also use natural stones and metals that have their own individual qualities. I do my best to represent as many angles of the piece as possible in my listings so that you can get a good feel for the piece that you are purchasing and can see as much detail as possible. Please make sure that you look at the measurements that I provide for each item, so that you can be sure that the item is the size that you expect and look forward to. I create my pieces to withstand normal wear, but please treat all jewelry purchases as you would any fine jewelry investment. Do not wear them in the water, in the shower, while doing dishes, and do not treat them roughly. When done wearing please return them to the original box, or other safe, soft secure environment. I hope that every one of my customers is happy with the item that they purchase. I am honest with my descriptions, and as accurate as possible with my measurements. I also do my best to photograph my items in excellent light so that they accurately represent my items. ---- BUT ----- Please know that computer monitors vary, and a photograph on screen is not going to match exactly the tones and shades of the natural stones and metals that I work with. I often use recycled materials in my work. I use green processes whenever possible. I use recycled silver and non-toxic pickle at my silver bench. I recover as much silver as possible in my process and send it back to be refined and used again. The pretty boxes and the shipping envelopes I use to package my pieces are created from recycled materials also. I believe that working this way is the only option - given that we only have this one planet and our resources are limited. I am committed to finding more ways to be responsible and green. In the unlikely event that you are not happy with the item that you received, or you feel the item you received does not match its description, and you would like to return the item, please CONTACT ME - WITHIN 48 HOURS OF RECEIVING YOUR PACKAGE - to let me know that you would like to make a return. Please let me know your reason for return and allow me the chance to rectify the issue if possible. I want you to love the item that you invested in and will do as much as I can to make that happen. I consider returns of ready to ship items only and each request for return is considered on a case by case basis. I get very few returns, so each is a new experience. Your return may be subject to a restocking fee (30% of the items cost). I DO NOT OFFER REFUNDS / RETURNS / EXCHANGES on Custom orders. Return packages will not be accepted and refunds will not be given without prior communication with me. (ie: PLEASE CONTACT ME FIRST). I reserve the right to refuse a return under any circumstance that does NOT involve a defect of the item that would inhibit its wear-ability. In this rare situation I would prefer the opportunity to make a repair so that you may enjoy your jewelry item. I reserve the right to refuse a return after 14 calendar days of receipt of your package being received has passed. Your item must be returned to me in new (unworn) condition in its original packaging within 7 business days of the day you received it. Contact me for the shipping return address. Please ship it back to me via USPS with tracking and insurance - and provide me with the tracking number so that i may watch its progress back to me. I will issue you a refund for the price of the item, less any restocking fee that applies. Exchanges within a week (7 calendar days) of purchase of ready to ship items may be considered on a case by case basis, please contact me to discuss. Payment is by PayPal or Etsy Direct Checkout. Your Credit Card can be used with either payment option. Most "ready to ship" items are mailed within 24-48 hours - and often ship the same day. Postal holidays, weekends etc may make it a day or so longer. If you are in a particular hurry to receive your package please let me know and I will do my best to accommodate. Most packages end up at their destination perfectly as planned. But unfortunately once your item leaves my hands it is at the mercy of the shipping gods. Unfortunately, although I will do my best to help resolve an issue with delivery should one arise, - though its very rare - lost, damaged or destroyed packages do sometimes happen. Should this happen to your package, I will assess the circumstances and it will be dealt with on a case by case basis. For Domestic United States orders, Every package is shipped with tracking so that we both know when it has arrived at your doorstep. I will provide you with the tracking number as soon as it ships. Please note that I ship "SIGNATURE REQUIRED" on packages valued at $250 or more. Someone will need to be there to accept and sign. US and Canada: If you are in need of expedited shipping I can ship your item to you to USPS Priority or Express for an additional charge. Please contact me so that I can accurately estimate the costs and delivery time for this service. I have recently needed to increase my international shipping fees, as costs to ship around the world have gone up significantly. Cost to ship to very remote areas, or countries with special handling requirements for shipping may require additional shipping fees. If in doubt, feel free to contact me and I'll work with you to figure out the best option for you. Tracking for international shipments is not always possible, not every country allows or provides this service. Because I am usually unable to track international shipments, I cannot be responsible for lost, damaged or destroyed items. Also as unhappy as it makes me to say this, I reserve the right to cancel any sale if your country does not allow the item to be shipped in. (Some countries have very strict restrictions on what can be imported, and jewelry is sometimes on those lists). The actual value of the item you buy is the value that I list on the customs form. I will always be truthful and honest on the customs form and will not make adjustments to the contrary. Payment must be received in full before work begins. Time to complete custom order varies, but I usually ask for 2-3 weeks for fabrication. I will work with you to ensure that you are happy with the piece that I create for you. You will be involved in the process, from selecting stones to approving of any sketches done. I put a significant amount of work into the planing and design of these pieces so that they are perfect for my customers. For this reason, I do not accept cancellations on paid custom orders once we have agreed to move forward. If you have a special date in mind that you need to meet, please be sure to communicate that with me before requesting the item, so that I can check my schedule and make sure that I can meet your deadline. Custom orders may not be returned or exchanged and there are no refunds on custom orders. I will never share your email address or contact information with anyone. 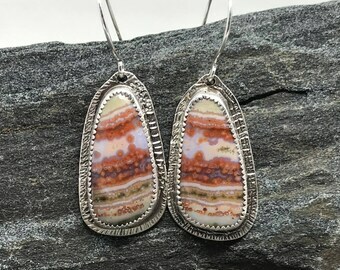 Buying from my shop creates a business relationship with me, and I may contact you from time to time about items you may be interested in, sales, specials or other useful information about my work. I do not have access to or ever see any payment information/credit card numbers etc. Etsy.com and/ or Paypal.com are SOLELY responsible for keeping your financial information secure. I accept custom orders when my schedule allows. Please contact me to inquire. Payment in full is required before I begin working on any custom order. I do not accept returns or exchanges on custom orders. 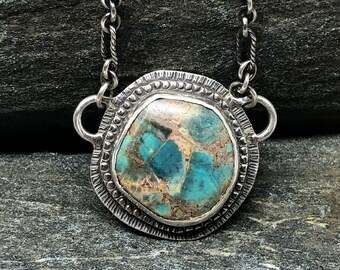 I create my jewelry pieces to last a very long time with proper care. Treat it kindly, and gently. I recommend that you remove jewelry before bathing, swimming, gardening, rock climbing, sports or any activity where the piece could be bumped or scratched. Many semi-precious gemstones (such as turquoise, variscite, boulder opal, pearls etc) can be damaged by water, soap and chemicals. If your piece includes a gemstone it is extremely important that you never immerse the piece in water, or allow any sort of chemical - even perfume or lotion - to come in contact with it, as you risk damaging the gemstone. 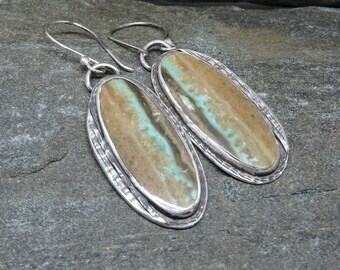 Most of my pieces have an intentional patina. If you must "clean" your piece, please buff lightly w/ a soft jewelers cloth. I do include a packing slip that includes the price with every package. If you prefer me to leave off the pricing on the packing slip, please ask. (International orders must include the pricing on the packing slip, no exceptions).